We don’t know when this game comes out, but for the sake of getting some talking going and to know a little more about each other. When you play the game, do you have a character in mind that you would try to get with first? Are they based on your favorite character, or are you saving them for last? I would start trying to talk to Applejack, and finding out what her story is about, she’s my favorite in the show, so that’s why I would follow her story first. Second would be Twilight assuming they keep her quirky. I'm looking most forward to seeing the finished Applejack route. I'm sad that I can't read it through in one go like you guys. Rainbow Wavedash wrote: I'm looking most forward to seeing the finished Applejack route. I'm sad that I can't read it through in one go like you guys. I wont be able to do it in sitting either, work and school eat up my time for the most part. I find it kinda funny that your name is Rainbow Wavedash and you were leaning to AJ. Still always nice to see another AJ fan. LTG wrote: I wont be able to do it in sitting either, work and school eat up my time for the most part. No, no. I mean you guys get to read it in order. I know all the spoilers going in. Blessing and a curse. LTG wrote: I find it kinda funny that your name is Rainbow Wavedash and you were leaning to AJ. Because Appledash is best pairing. My favorite character in the show is Pinkie Pie for various reasons, but I feel like in an interacting experience she could get annoying pretty quickly. Since Twilight is the main character, I'm just going to assume that she has the best route until proven wrong. As for what route I'll pursue, it's a rule of thumb for me (and from what I understand most others) that I'll answer each question the same way I would if confronted with that scenario IRL and let whatever happens happen. Wh-who said anything like that? Rainbow Wavedash wrote: I know all the spoilers going in. Blessing and a curse. I know the feeling. I have some routes I know I really want to try from the writing styles though, too. I'm really looking forward to Twilight's route. It sounds like it;s going to be super adorable. But Rainbow Dash's route is still gonna be the best. I would like a harem ending just because I wanna be that guy. 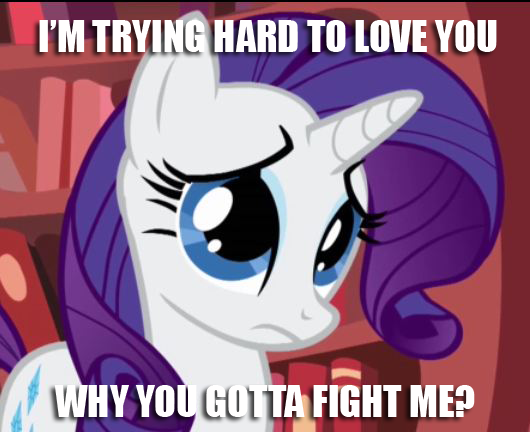 Also use this to see what your relationship is with the pony you intend to go for. Ceresbane wrote: I would like a harem ending just because I wanna be that guy. Harem you say, you can go for that in Analogue: A Hate Story. I think it was underrated, hence why I'm pimping it out right now. Though I enjoyed it (though it was not by any means amazing, in my eyes), it would be hard for me to class it as a harem. If that's your thing, then there are many, many, many other VNs out there, Analogue is not really a good example of a harem ending! Well that's no good, I've only read a few VN's not even 10 so don't worry about it. More back on topic you said a harem but since I doubt that will be an option the world (figuratively speaking) wants to know what route you'll be taking. I second this. Deep in everyone's heart we all know that Dashie will remain the coolest. (Tied with Fluttershy and Pinkie) But I'm most looking forward to Fluttershy's. Second would be RD than Pinkie than AJ and then Twilight and finally Rarity. Infinite sorries. I didn't mean it like that in terms of quality. I meant it in terms of how I'm going to read them. I'm sure Rarity's story is going to be good, but reading them in the order of how I like them in the show. Sorry for the mix up. I'm joking, don't sweat it! I understand you have your own favourite pony. There's always going to have to be a route that's played last, and it'd be foolish to assume that will never be mine. I do have to admit that she can be funny whenever she gets overdramatic and whenever she uses Spike for labor. After that I will likely spend a day or 2 saying how she was the best and likely get an unhealthy obsession with her. After that, probably Pinkie Pie. Why? Because she's Pinkie that's why, she's adorable. Then I guess RD, then Twilight, then Rarity, and maybe Fluttershy. I'm confident that her route will be good. She's just never been my favourite. But it will be Applejack after all of them. I plan to do Fluttershy first. I can't help that anymore than I could help doing Hanako first. After that I'll likely save Pinkie Pie for last and do the others based on what I see playing through Fluttershy's route. Dang, I do want to save my favorite pony best for last. It so hard to choose in order, I enjoy all the mane 6. I don't know what to choose first. So, I guess it depends on the choices in the game. I'll be honest with the choices or questions that handed are to me in the game and see what path will lead me.